Ready…set…RELAY! It’s time for a cure! – Ce Soir Arts – Be inspired tonight! Ready…set…RELAY! It’s time for a cure! Relay For Life® is the signature fundraiser of the American Cancer Society. 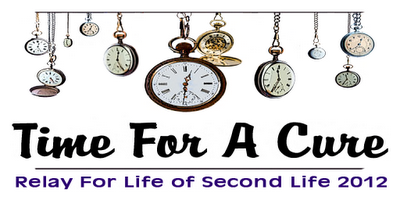 Relay For Life of Second Life (RFL of SL) is an annual activity that takes place in Second Life® in July each year. Volunteers form or join teams to have fun while fundraising and raising awareness from mid-March through mid-July. In July teams build campsites and walk a track, just like in a real world Relay. The main RFL of SL track event this year will take place on July 14-15. We will walk a virtual track for 24 hours, just like in a real world Relay For Life. Team members build and gather at their team campsites, enjoy live music, participate in fun events, and explore the many Relay sims and the incredible builds by some of SL’s top designers, as the event runs overnight and into the next morning. Yes, indeed it is Time for a Cure! Do whatever you can to support these and other Relay for Life efforts in SL – and RL. Your help will be greatly appreciated, as all benefit when progress is made. THANK YOU! Below are some RFL events coming up. See you there! 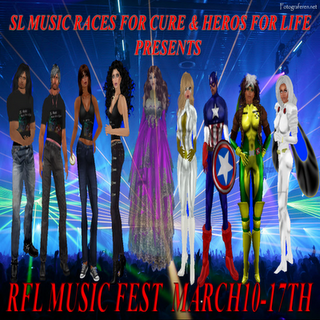 March 10-17 – RFL Music Fest! July 14-15, 2012 — RELAY WEEKEND! Next Skye Galaxy and Anek Fuchs – Live on Sunday!